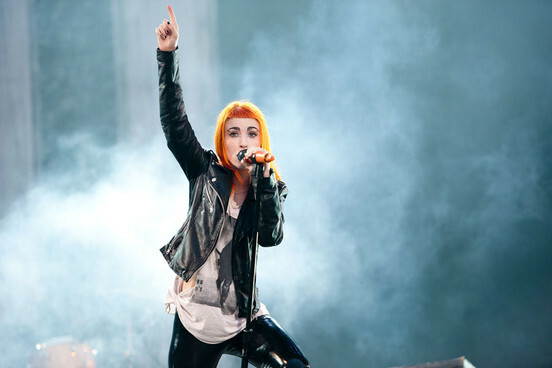 Paramore's Hayley Williams has revealed that the band's long-awaited fourth album has been influenced by Alt-J. The singer was speaking to Absolute Punk when she explained which artists inspired the group when they were in the studio recording their self-titled new album. When asked about what influenced their writing and recording, Williams said: "Taylor (York, guitarist) was listening to Alt-J a lot, I was listening to that Sirius XM channel called 1st Wave every day just getting my gothy vibes on in the car, and Jeremy (Davis, bassist) keeps us well versed in new hip-hop." She continued: "I'd be lying if I said we didn't collectively listen to more electronic music during this process than ever before. I think it's just because that genre is super hot right now. Even so, I wouldn't say we sound like any of those bands. It sounds more like someone let us loose in a blow up castle full of instruments and we just bounced around it in for a few days." While some fans may be worried to hear of the band's new influences, especially the news that they've been listening to more electronic music, Williams is quick to play down any fears, adding: "No dubstep was jammed in the making of this album." Paramore release their self-titled fourth album on April 29, 2013. New single, 'Now', is available from January 22. You can hear a sneak peak of the new track by clicking on the video below.